Who doesn’t love wisteria, the endless blooms that blanket the ceiling of a terrace, balcony or pergola? They are so delicately intoxicating and whimsical, especially when floating in a soft spring breeze. As magical as they are, they do come with a commitment, a relationship commitment, if you will. However, unlike most relationships where give and take is necessary for the success of the long term commitment, this one is a bit one-sided as you must be completely dominant and show them who’s in charge. Your pruning shears must not be a stranger to your wisteria, and you must not be afraid to use them frequently. 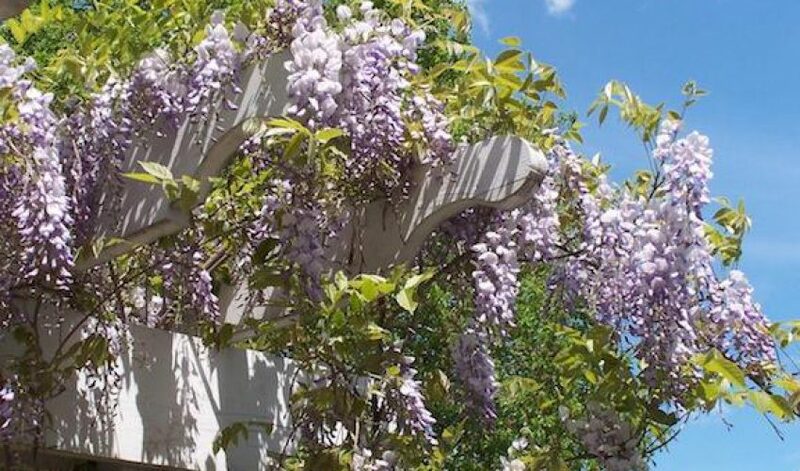 Pruning is necessary for most plants but especially for wisteria. Why? Because not only are wisteria vines extremely tough and durable. Left unattended, they will most assuredly become an unruly and tangled nightmare. “Live and let live” does not apply to wisteria. It will misbehave, outgrowing its space and violating your home or any nearby structure. Wisteria is indiscriminate in its destructive proliferation. It can destroy siding, gutters, downspouts, posts, pillars and lattice by wrapping itself around it and eventually strangling it. It can even strangle a large tree. So you see, you must become the Master or Mistress of your wisteria. In fact, for the best result — and by that I mean a multitude of blooms — frequent pruning is essential. But when to prune? There are many schools of thought. Some recommend once in summer and again in winter. My personal experience — and my Grandmother’s knowledge — lead me down a different path. She was the master and the one who taught me to take charge of the wisteria and show it that I am the boss. What does that mean? It means pruning throughout the growing season, plus a winter pruning — in late February or early March. To ensure the plant’s cooperation, I simply leave unpruned the vines that are growing in the direction that I want. Those will become leaders. All other unruly vines must be trimmed back during the growing season, allowing the leader to become one of the primary branches. In addition to controlling the direction in which it is growing, pruning serves other purposes as well. It allows the main stalk to become more robust and secure, it allows you to control its’ shape and it promotes the growth of flowers. Come February, I go back to the vines that I pruned throughout the season and cut them back to expose 3 to 5 buds because flowers occur near the base of the previous year’s growth. These 3 to 5 buds will be where the flowers come from and pruning in this manner will enhance the visibility of the flowers. When selecting wisteria for your garden, always buy one that already has blooms on it. When wisteria is grown from seeds, not grafts, it may take upwards of seven years to bloom. Grafting is much faster and only takes about three seasons for blooms to appear. So why not ensure blooming your first season? You do this by buying a plant with blooms. All you need to see is one to know that more are on the way the same season. Wisteria loves sunlight. Plant only where you are likely to get a minimum of six hours per day of direct sun. Obviously it needs water, but the great news is that mature wisteria is drought tolerant. Truth be told, drought stress causes the plant to produce blooms. Who knew?! However it does require a watering schedule its’ first year with proper drainage. While the root system is getting established it requires regular watering and should not be left to dry out. Having wisteria on my pergola is wonderful because one of the most rewarding introductions to spring is when they bloom in their full glory. Wisteria’s regal elegance makes her the grand dame of my garden because of her tenure there. She has required lots of attention from me and in return, she delivers each and every year. How’s that for a lesson in commitment?